Quaker Pointe's Tru Jager aka,Jager or blue boy has gone to live with his new family in Raleigh NC. There he enjoys the city life with a twist of being able to go on geological explorations with Tyler on a regular basis. Favorite Things: Laid back happy go lucky fellow that enjoys working and adores children. 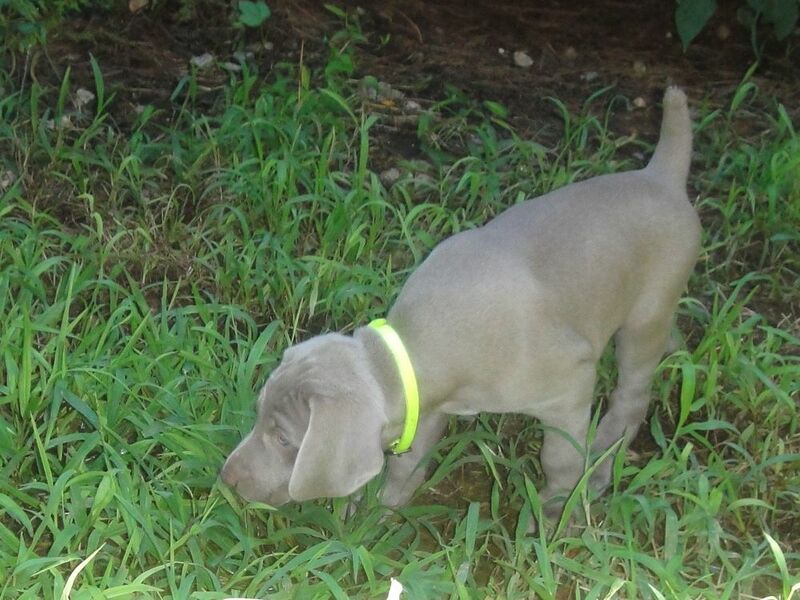 Can CH Blitzkrieg's QP Trax Whistlin Dixon aka Burgundy Boy was given to Blitz’s Owner Lance Fargo where he traveled out west to find his home with Shirley Nellson and Trax Weimaraners. Shirley has competed in in various venues with much success. Shirley has accomplished may things with Dixon and he continues to be an asset to her team at Trax. Quaker Pointe’s Tru Bravado aka. Bravo. Bravo was my pick of the Puppies we had with Tru and Blitz a few years back. He was a lovely and intelligent dog that knew no enemies. He was large in size and had amazing intelligence. When he was a little over 1 year He was stolen from our backyard in Clayton NC. There is still an open police/sheriff investigation on his disappearence. That being said not a day goes by that we do not still miss him and his loving personality at Quaker Pointe. Quaker Pointe’s Tru O'Henri aka Red Boy, or Henri decided he did not wish for a life up in Canada. He found his perfect family in Raleigh NC. He is an active dog with a zest for life that loves to play ball and spend time with his boys. Quaker Pointe n Weimshadow’s Tru Zennith aka Purple Girl, or ZeZE found her home in Nebraska with Sally Jo Hoaglund and the Weimshadow gang. Sally Jo participates in Show, Field, Agility and NAVHDA so ZeZe will certainly be busy. ZeZe has been competed in field and NAVDA events and has given Weimshadow 2 beautiful litters of puppies her bigger than life personality and willingness to please will always be her legacy there.